The Online Mobile Shopping website is a web based application developed in visual studio 2010 using c# language, which helps people to find latest mobile phones with variety of models on internet. This Online Mobile Shopping website allows people to buy latest mobile phone from website by making online payment. Online mobile shopping website has main two module : Customer and Admin. The customer is a user who want to buy products from our website. 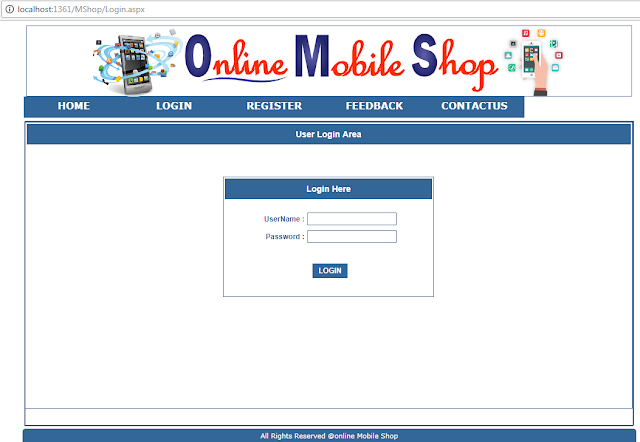 For buy mobile user need to register first and after he can buy any mobile product and finally make a online payment for confirm the same order. After doing payment for order the item will be delivered to customer delivery address. The Admin is a responsible person to run the whole website means the owner of a website. Admin can manage all mobile products, user detail, order detail, payment detail and maintain item stock. Admin can add, delete and update any information about product. Admin : Admin is a responsible person to run the whole system. Admin can add, delete, update all information about products. Admin can maintain product stock detail and manage order detail and payment detail. Customer : Customer is a visitor, who visit the site and buy something from our website by making a online payment.